In the confines of Radio France there are two performance spaces. In Room 104, Alexandre Desplat is rehearsing a program of his film and concert music. In the auditorium, I am preparing works by Leonard Bernstein and Aaron Copland. Among the pieces on my program is the Lincoln Portrait, that most American and patriotic of works written for the concert hall. But this is France. I have never conducted this piece outside of the United States. Usually it is reserved for celebratory events, such as the Fourth of July, but it has had notable performances by important orchestras, made especially powerful when the narrator utters the words of the sixteenth president. I have done it with personalities as diverse as Walter Cronkite, James Earl Jones, Ted Kennedy, Charlton Heston, Colin and Alma Powell, and Coretta Scott King. It does not matter who is speaking; the quotations used by Copland, coupled with his great gift of music drama, always makes this piece a success. This time, though, the composition has taken on a very different meaning for me. My wife and I arrived in the City of Lights this past Saturday during the third consecutive week of protests and demonstrations against the French government. As we drove toward our hotel, the sight of cars burning, windows smashed, and stores boarded up gave us both a feeling of unease and insecurity despite, or because of, the presence of armed guards and police. At this point, I started to realize that what we were going to perform now began to take on an entirely different meaning than the one intended by either Lincoln or Copland. If one of the purposes of the Yellow Jackets (rioters wearing work vests) was to give more empowerment to the citizens, how can we interpret “government of the people, by the people and for the people”? Isn’t that exactly what the demonstrators were espousing? Certainly their methods were violent and disruptive, paralyzing the economy and causing harm to many. Just as certain was the knowledge that this was not what Lincoln meant during his speech in Gettysburg. And then there is the music—tender, noble and powerful. I have always enjoyed conducting this piece, but in taking it out of the context of its usual presentation during ceremonial concerts, I have come to a true understanding of the greatness sometimes overlooked in this amazing composition. Our narrator is Lambert Wilson, a French actor and singer best known in the States for his roles in the Matrix films. When he was a youngster, his desire was to be an “American” actor, so he studied in London, where he perfected his English. You would never know he was French when speaking with him or hearing him recite the words of Lincoln. We had thought to do the narration in French, but after listening to the translation, we realized that the meaning was stronger in the original. At our dress rehearsal, on the day that George H. W. Bush is being laid to rest, when our system of justice seems to be constantly in question, when heads of state stand accused of murder, each of us onstage is caught up in what was said 113 years ago. What do those words mean today? Could this confluence of utterances and euphony make a difference? This was my first time in the refurbished auditorium of the Radio France building. Although it is in exactly the same physical space as before, I kept getting lost in the labyrinth of black hallways. The new hall looks good and has a better acoustic than most of its counterparts in various broadcasting houses throughout the world. And I was fortunate to have Jenny Gilbert, from Lyon, leading the string section. Coupling that with the presence of the orchestra’s manager, Jean-Marc Bador, formerly executive director in Lyon, it was like a homecoming in a different city. The earlier pieces on the program were, for the French, relative rarities. A couple of them are heard very rarely even in the States. We began with Bernstein, his Missa Brevis. My only other experience with this work was when I recorded it with the BBC Singers. Derived from incidental music created for a play and later put into this version, the piece is attractive, but you would hardly know who wrote it. With just chorus and a couple percussion instruments, as well as boy soloists, it made an effective entrée before the main work on the first half. It had been a few years since I had seen Midori, and it was wonderful to see her in great spirits. She had made a considerable splash with Bernstein’s Serenade when she was only 14 years old. Performing it with the composer conducting in Tanglewood, she broke a string during the concert and had to trade her instrument out with the concertmaster. On that humid night, yet another string broke, and she proceeded to the violin of the associate concertmaster. Any more and the piece might have been performed minus a violin section. Midori caught the twists and turns, lyricism and perkiness of the piece. The orchestra of strings and percussion seemed to have a good time and played very well. Some people do not care for the programmatic aspect of the work and its allusions to the Dialogues of Plato. Well, you cannot change the inspiration for the creation of the piece, but it is not necessary to hone your Greek literature skills to enjoy these wonderful 35 minutes. After intermission came two lesser-performed works by Copland. The Danzón cubano has long been a favorite of mine, balancing the other Latin American works by the composer. Full of humor, it shows off his love of the southern part of the continent. Next came three choral transcriptions of his Old American Songs. Although better for solo voice, these little pieces gave the chorus a chance to show off their English skills. It was especially fun teaching them to make animal sounds in “I Bought Me a Cat.” For the final verse, “My wife says, ‘Honey, honey,’” I thought it would be fun to change it to ‘Cheri, cheri.’ The audience loved it. Following the Lincoln Portrait, Mr. Wilson showed off his singing abilities with an encore of Bernstein’s “Words, Words, Words” from Candide. Though not the heaviest of programs, it seemed a nice way to begin the holiday season. We headed home still worried about the French capital and the world in general. This was supposed to be a quiet time at home. We were still getting acquainted with the subtleties of the new house, and I was relearning where everything in the city was located. Much has stayed the same, but a lot has changed. The interesting part was finding places that existed when I was here 50 years ago but that I had never noticed. For example, one of the main streets, Olive Blvd., I only knew as the avenue that went from the park and wound up downtown. Yes, it extended further west, but I rarely frequented that part of town. On an afternoon drive, I discovered that this is a haven for all things Chinese, with at least eight restaurants as well as other establishments from that region of the world. In addition, there is a Ugandan eatery as well as Jamaican cuisine and other more exotic culinary experiences to be had. And then there is Nobu, but not the famous chain with its pricey menu. I did remember this Japanese restaurant; we used to go there when Daniel was around one year old. I am not sure how much I got to eat, as the moment we entered, he started crying. I would pick him up and hang out in the parking lot, trying to do a lot of soothing. The same chef is still there, so Cindy and I popped in for dinner one night. Glad to report that the sushi is excellent. We also visited The Hill. This is the Italian district, dotted with fine restaurants and bakeries. Many immigrants settled here, and some celebrities were born and lived in the neighborhood. It took a while to find the plaques marking the locations where Yogi Berra and Joe Garagiola lived—there are a lot of empty spaces where there used to be homes. One can only hope that the heritage of this area of town is not lost. Aside from putting a medical team together in a city that has remarkable facilities, we had more mundane matters to attend to as well—deciding which market would we use, choosing a dry cleaner, and finding the quickest routes to get around. High on my list was finding someone to cut my hair. A flood of memories came rushing back. Maybe it was the smell when you opened the door. Could be the look of the place. Possibly the clink of the old cash register. One thing for sure; it is just not the same anymore. 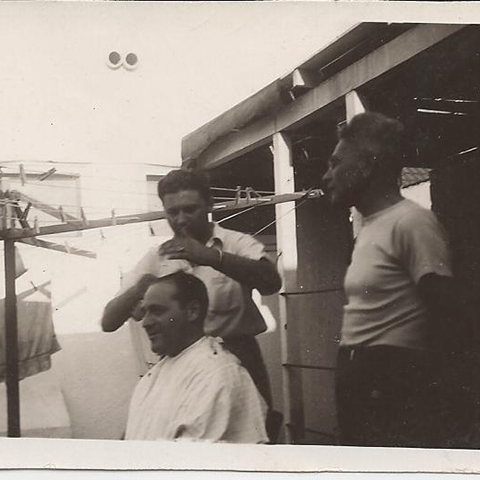 My grandfather on my dad’s side was a barber. He plied this trade in the Ukraine and continued to trim and cut when he arrived in St. Louis in 1913. As far as I know, there were no “stylists” back then. You just went in and sat in the chair, and the tonsorial specialist did the rest. Like the days-of-yore bars, it was a refuge for gentlemen, a little bit of time spent away from the hectic life outside the parlor. Perhaps because it was my grandfather, I don’t think I cried throughout what is sometimes a harrowing experience for a child. My first haircut was not a problem, so I assumed that when my son got his locks trimmed for the first time, he would also get through it unscathed. It was at the small shop in Harrods department store, which took a bit of time to get to owing to a maze of pathways and lack of signs. Daniel knew that something was about to happen. He was fidgety and clingy, even though there were lots of things for kids to do to keep them occupied until it was their turn. It didn’t help that the young man in the chair was screaming his head off while we waited for Daniel’s turn. With Little Lord Fauntleroy out of the barber’s scissor path, it was time for my son to get cleaned up. That empty chair must have looked monstrous to a two-year-old. Even with Mum and Dad there to give support and sympathy, nothing could be done about the wailing shrieks emanating from my son. The ordeal ended, and Daniel leapt out of the chair, anxious and hoping never to return to the London department store. After a while, and some ice cream, the experience seemed like a thing of the past, as most semi-traumatic events do to a first timer. I did not think about my early barbershop experiences at that time, but recently, I had occasion to amble into a shop that offered a hot towel shave, something I had not had in quite a while. That is when I started thinking about my grandfather and my own head of hair. Actually, I don’t remember a lot about Herman’s shop. It was small, and he was one of two barbers there. There were just two chairs and another for the next customer. I probably went about once every two months or so. My grandfather passed away in 1949, when I was just five years old, and by then, my family had moved to the Wilshire-La Brea District of Los Angeles. This made sense, as my dad’s work at Twentieth Century Fox and my mom’s over at Warner’s in the valley made the new home equidistant for their travels. When it came time for my mane to be cropped, we found a local barbershop nearby. I can still picture it today. 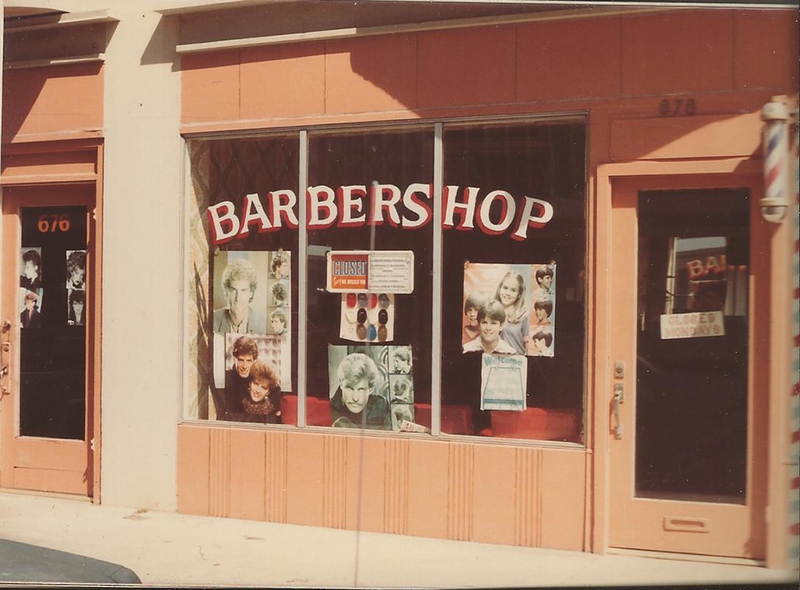 Located just off the corner of Cochran and Wilshire, next to a bakery, was an establishment that boasted three barbers. Mine was Andy. No whining or complaining from this seven-year-old. I took my turn in the chair and waited for Andy to start the ritual. They did not shampoo your hair in those days, at least not prior to the cut itself. It was simply snip, snip, snip. As I watched the strands trail down the apron that I had to wear, it was not difficult to imagine feeling lighter. My early style was a crew cut with just a bit of Butch Wax to keep the front standing straight. Bald was not in vogue yet, but with my very light, blonde hair, I might as well have had all of it taken off. Andy would take his time, thoughtfully examining the shape of my head, thinking about the evenness of the cut. Throughout the shop, the other (usually quite a bit older) customers were chatting about the news of the day, mostly sports. My appointments were usually in the afternoon, when the Herald Examiner came out. This newspaper, with its green front page, never failed to make an impression. A few years later, I would spend a summer delivering these to the doorsteps of readers. Biking all over my neighborhood, reaching into the bag that was draped over the wheels and attempting to accurately throw the paper, was the highlight of my day. But the real treat at the barbershop was what came after the cut itself. There was a small, black machine that, when pressed, emitted hot shaving lather. Now I hear you asking, “Leonard, if you were seven, why did you need a shave?” Well, that is the way barbers trimmed the fine hairs from your neck. First, Andy would pull the lever on the side of the chair, placing me in a prone position. Then he put a warm towel around my face and went to the little black box. I could hear the whirring of the foam as it came out of the spigot. Removing the rag, he slathered the stuff on, with its very slight fragrance. Next came the ritual I could not see, but which was clearly audible. Next to the chair was the leather strop, a piece of material with which the straight razor was polished and sharpened. Swish, swish went the blade, and then it was brought up to my neck. In the ten years that I would visit, Andy never drew any blood. When I was old enough to shave by myself, I needed to keep a set of styptic pencils handy. But there were still a couple things left for the Barber of Cochran to do. Another hot towel to take off excess lather, followed by a light dowsing of bay rum aftershave. I can remember that sweet smell even today. It carried the fragrance of a person many years older than me, and how grown up that felt. I was part of the club. Just before the final brush, there was one more facet of the ceremony, also looked forward to with great anticipation. Andy would place a device over his wrist and when it was switched on, it became a scalp and shoulder massage machine. Pure bliss. And Andy did not skimp on the manipulation time. After paying him three dollars and fifty cents, I walked into the usually bright LA sunshine, feeling as if there was not a care in the world. Maybe there wasn’t back then, at least none for a school kid in the 1950s, growing up in the middle-class lifestyle of the West Coast. Sure, I saw the headlines when I was folding up the Examiner: McCarthy hearings, Salk vaccine, Korea. None of them seemed to matter. Not as long as Andy was there, and I could dream of the next time bay rum would be a part of my being. There are probably places like this around today. I have yet to find that blend of old and new school. Then again, there is not so much to work with on the top of my head. Did I tell you that while I was convalescing following my bypass surgery, I tried to grow a beard? It seems trendy for those of us in the older generations to attempt this. As for me, it was never part of my thinking, primarily because it seemed like a lot of trouble to maintain. After three weeks I was looking like a homeless person living by the railroad tracks. Maybe I should have waited a bit longer, but it was getting annoying, and out came my multi-blade razor, minus the strop. Sorry, there are no pictures of my whiskered countenance. But I did make up one event in December that had to be postponed due to my surgery. The Chamber Music Society of St. Louis had planned a Gala last May to honor their 10th anniversary as well as my 50th since my debut in the city. It was to be a sequel to Notes from Hollywood, a concert saluting composers who wrote for motion pictures but also continued to write for the concert hall. My contributions were stories from the Golden Years, including memories of my family. We were able to keep the theme, and several of the pieces were new to me, including works by Castelnuovo-Tedesco and Rota. Musicians included members of the St. Louis Symphony as well as some young string players from an initiative that the society started a couple years ago. There were proclamations from the city and county, as well as one welcoming Cindy and me back. The most moving moment was a video with interviews from friends, as well as words and music by Daniel. His poise on camera truly took me by surprise. Maybe another career path? We were also joined on this occasion by the great former shortstop of the St. Louis Cardinals, Ozzie Smith. He is the gold standard by which all who play the position are measured. He is also a great guy, and we had a chance to grab dinner a week later. Daniel and Bridget came out to visit for a few days. It was fun showing them around the city, walking on the riverfront and standing next to the arch. We hosted a kind of open house and saw many people who have been a part of Cindy’s and my life. I caught up on some TV series and movies, and I shared Casablanca with the kids, who had never seen it. Originally, I thought that Cindy and I might be away from home for New Year’s—maybe somewhere warmer, or possibly a return to Canyon Ranch. But our new lifestyle actually means that we do not spend as much time in our house as we did while I was a music director. So, we thought that just sticking around and enjoying the digs would suit us quite well. What I did not count on was actually doing some conducting as 2019 came around. But what better way to celebrate this new existence than to share it as a surprise guest at the St. Louis Symphony New Year’s Eve bash? They do it a bit differently than other orchestras, only announcing the conductor but not any guests, soloists or even the program. Ward Stare, the former resident conductor and now head of the Rochester Philharmonic, was scheduled to lead the evening. Since he had been a student as well as a colleague of mine, it seemed appropriate to ask if I could help out a little and participate in some way. The conducting part took the form of saluting a couple of St. Louisans, one from the past and one recent arrival. Cindy’s arrangement of Shenandoah, which was performed a few weeks earlier with piano at the Sheldon, now appeared in its orchestral guise. This was followed by my dad’s Carmen’s Hoedown, something that I usually do as an encore. But it was my participation in an alternate role that was probably more keenly anticipated by the few people who knew it was coming. In 1967, Peter Schickele released his third album, entitled P. D. Q. Bach on the Air. The disc contained a play-by-play commentary on the Beethoven Fifth Symphony, done as if the performance were a football game. I had conducted this concoction a couple times with Peter as one of the broadcasters, but this time, I would take the lead role as on-air personality. Working from his original script, I fashioned a different, St. Louis-style take on the proceedings. Ozzie Smith joined me in the broadcast booth to offer his opinions as my sidekick. We put in all kinds of things related to Ward, concertmaster David Halen, and many others in the public eye. At one point, the principal double bass suffers the ubiquitous groin injury that most ball players seem to acquire at some point in their careers. He hobbled offstage, only to be replaced by Don Martin, a member of the St. Louis Symphony bass section for 56 years. This was his final concert, and even though the whole schtick was meant to be humorous, perhaps it was this moment that will be remembered by most. So we’re very glad that 2018 is finally over. Once again we’re on the cusp of a new year, another chance for change. And once again, we find ourselves feeling stirrings of hope—hope that the coming year really will be better. Why do we feel this way? Why, despite all our past disappointments, do we believe things really can improve? Because we are morons, apparently.